Because of nobody at home to take care my princesses yesterday, we can't leave them alone at home, we afraid suddenly raining and Golden Dou Dou will gone case when raining. So, at last we decided to bring them go along for dinner. Isaki Japanese Restaurant is a dog friendly restaurant but i still called up to double confirm, the lady confirmed that is dog friendly and immediately ask for our reservation, alright dinner place settled! I was reserve dinner at 6.30pm - 7pm because i think that time is not much people start to have dinner there but too bad, my courier company was delay their pick up time and i wait until 7pm, haiz...frustrated!!!! Speed up all the way and reached there around 7.30pm ( i was called to delay my reservation) , Oh My! there are quite a lots of people, and most horrible is....kids kids and kids!!! Princess V dislike kids, she will bark loudly and loudly. Normally when kids heard dog bark, they will follow dog bark or tease them, for what kids? you really so wanted to be a dog?!! where is your manners? is it only for human?! Seriously i am really very easy get mad when kids like this, acting bark = very rude attitude for me, do you ever think when you acting bark and teasing dog, the dog will bark even louder and very noisy? Ok, we were settle down as quick as we can, luckily Princess V just bark for a while or bark when people come in, another time she was starring on our foods. We finish our dinner in very very short time , really not time to take picture of the foods, anyway the foods is so so but japanese and foreigner like to go there, 80% are them. Since my 2 princesses so pity at that restaurant, and we finish dinner very quickly, so we planned to go Desa Park City have a night-walk. At night, Desa Park City is not too happening as evening. There are few people cycling , mostly peoples are walk with dog. 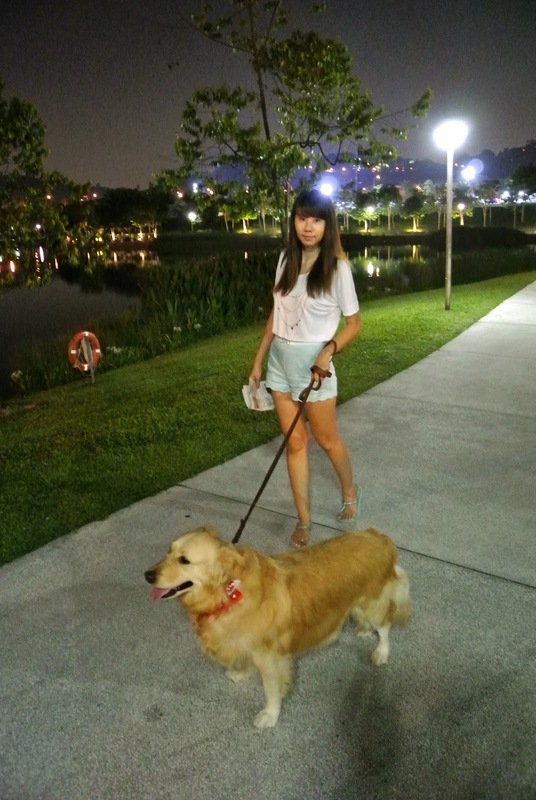 I found Golden Dou Dou is love to night jogging, she seems very active compare with evening walk ( she will walk asap and immediately go back to car enjoy air-con ) . hello! 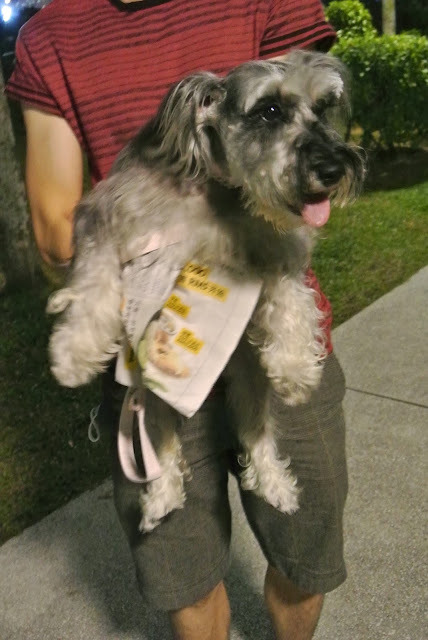 is night walk safe for us and dogs at desa park? it seems quite well lighted. my dog and i usually go during weekend day time. but weekdays, i can only make it at night. please let me know if safe and okay to walk a night. tq!